My girls absolutely love blueberries, they just can’t get enough of them in the summertime. I love the fact that they are just so good for you, so we really stock up on blueberries & try to find local places where we can pick them to get even more. Blueberries are a pretty universally popular fruit, which makes it the perfect fruit to use in pies for holidays such as the 4th of July. Now that we are starting June, I thought this would be the perfect time to share a favorite family recipe that my grandma made for years & my aunt now makes for summertime gatherings with the family. 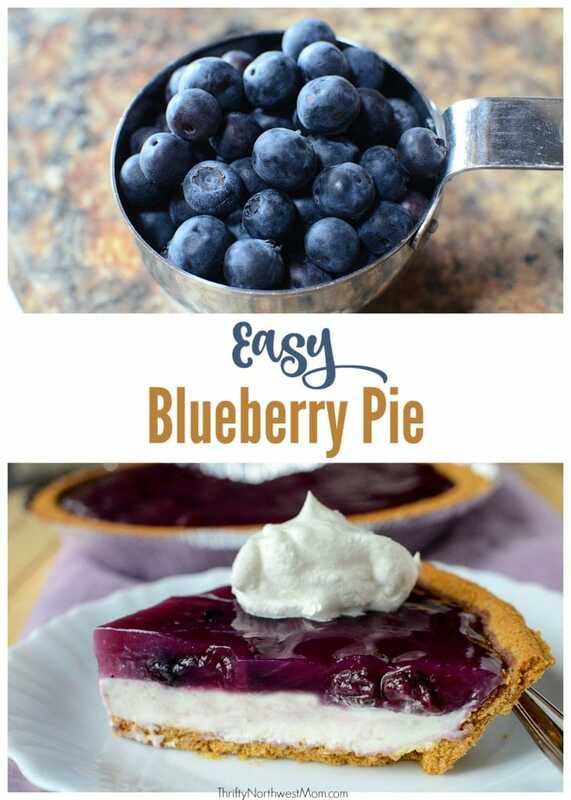 It’s a must-have staple at all of our 4th of July gatherings It is my absolute favorite blueberry pie recipe and it’s really quite simple to make – you can make this in less than 30 minutes (with time to cool in the fridge) for a easy dessert to bring to a gathering. Put graham cracker crust into pie pan. 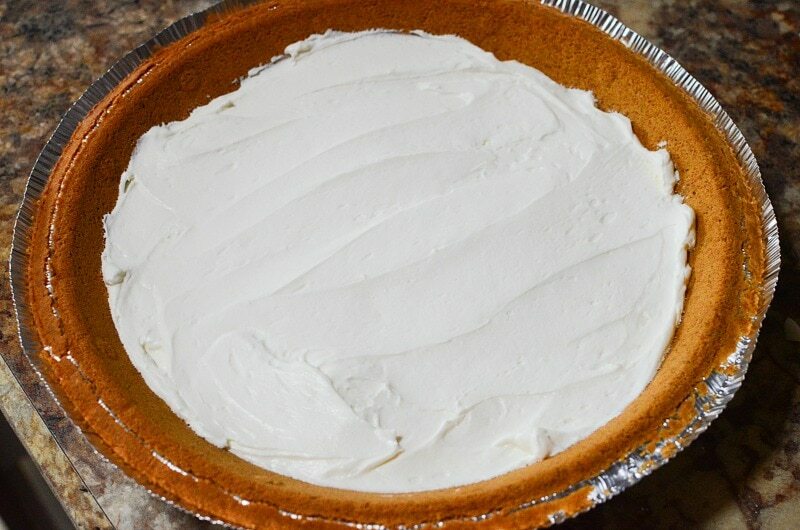 Mix together 3 oz cream cheese, 1/2 cup of powdered sugar & 1 cup of whipping cream (can use Cool Whip in place of whipping cream). 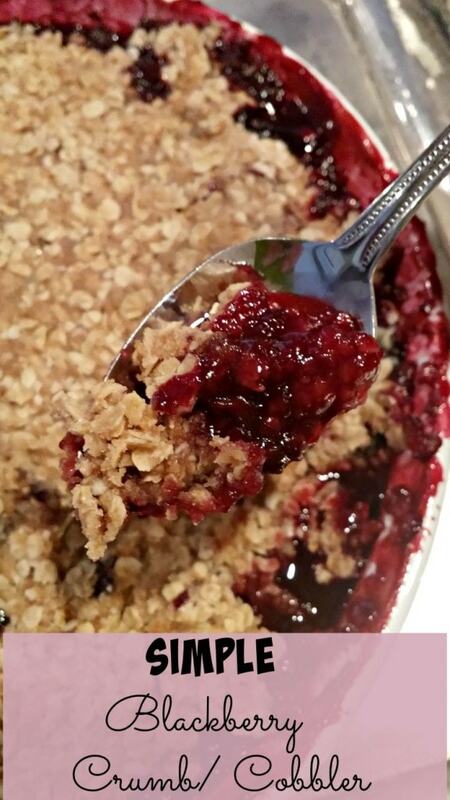 Layer this mixture on top of the graham cracker crust. 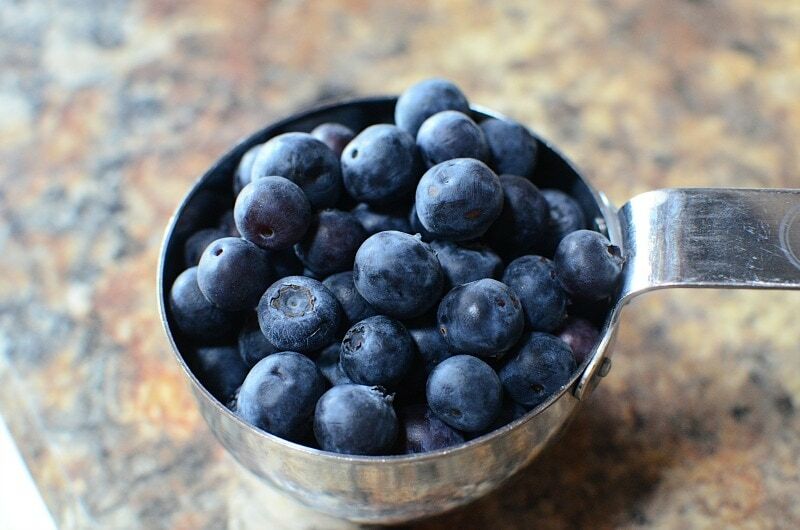 Cook the blueberries by heating up 1 cup of blueberries with 1 cup of water in a small saucepan. Boil for 3-4 minutes & stir regularly. Strain the cooked blueberries and put the strained liquid back into the saucepan on low. Place the cooked blueberries on top of the cream cheese/sugar/whipped cream layer in the pie pan. Combine the strained blueberry liquid with 2/3 cup of sugar, 2 tbsp cornstarch and 1/2 tsp cinnamon on the stove while stirring. Stir well until it’s thickened on low-medium heat. 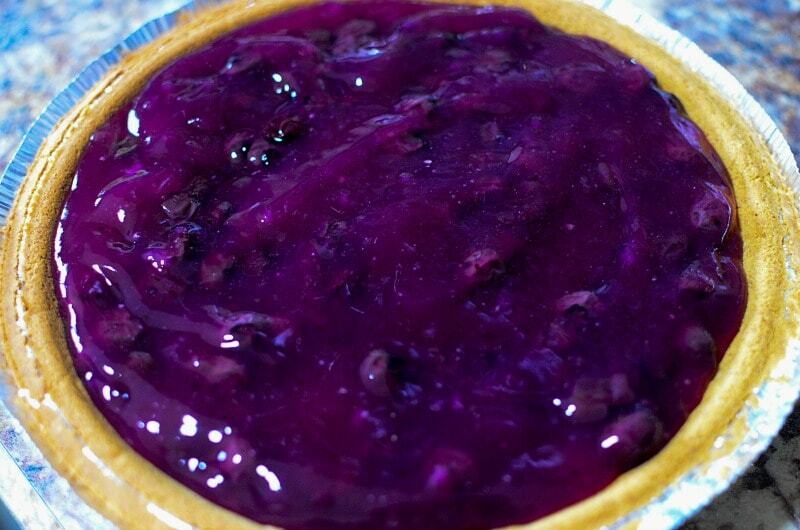 Spoon this blueberry glaze over the blueberries in the pie pan. Place in the fridge to cool. It’s best if you serve this recipe on the day that it is made as it’s so delicious when it’s fresh! Enjoy! Let us know if you make this & how it turns out! 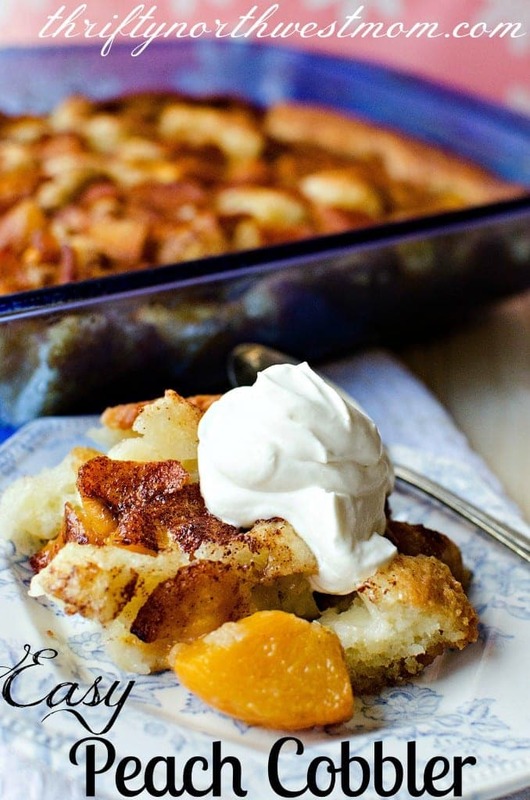 We love to serve this with vanilla ice cream! Baker’s Advantage Ceramic Deep Pie Dish (9 1/2 in.) 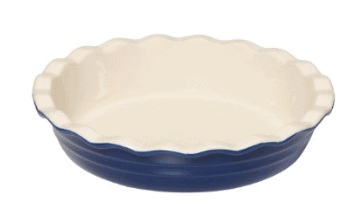 – This pie dish gets 4 1/2 out of 5 stars & features a glazed blue exterior & cream interior so that it is perfect to go from the oven to the table. ORBLUE Flatware Pie Server Stainless Steel Pie / Cake Cutter – I love not having to dirty up extra dishes, so this cutter is perfect for pies (or cakes) & lets you both cut & serve all in one. 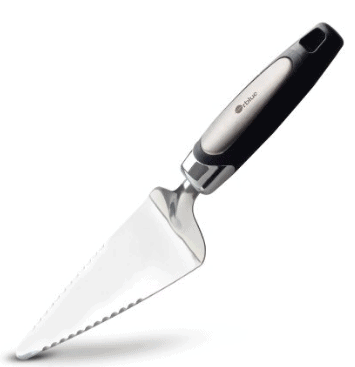 Slicer is rust-resistant & dishwasher-safe – Use it for serving cake, quiche, lasagna or pizza too! 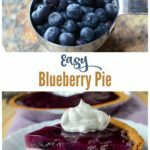 Here’s a printable version of the Easy Blueberry recipe for you to print off to put in your recipe binder or notebook. It’s best if you serve this recipe on the day that it is made as it’s so delicious when it’s fresh! What are your favorite easy summertime desserts?